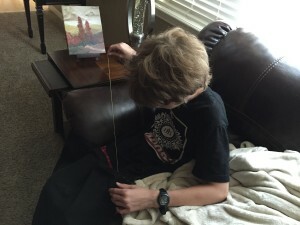 The long days of summer often challenge my mommy-frazzled brain that fun and free activities that entertain kids are as elusive as spotting the Loch Ness monster. But finally (out of desperation) creativity struck my brain. I had an idea that just might occupy the super outgoing and talkative personality of our youngest son Tommy. He loves the video game Legend of Zelda. Like, a lot. 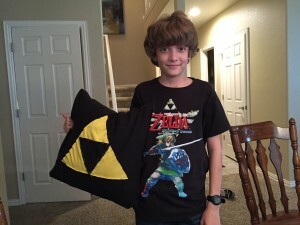 So, the idea popped into my head that it might be fun for him to try his hand at stitching a Zelda-themed pillow. 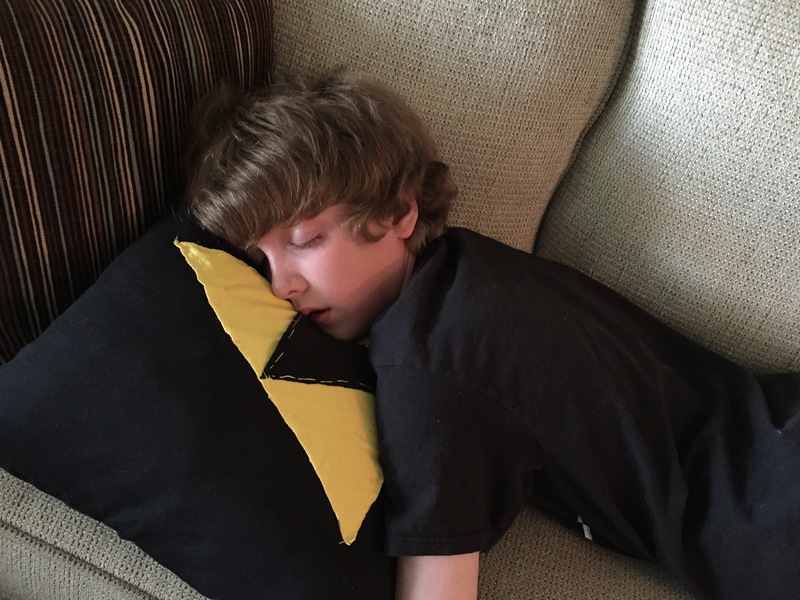 Not wanting to overwhelm him with complex designs right out of the gate, we both agreed that the famous Triforce symbol, which represents Link’s ability to harness power, courage & wisdom in order to save Princess Zelda, would be a great and simple pillow design. I challenged myself to find everything we would need to make this pillow from stuff we already had in our house. And we did. We found an old throw pillow shoved in a linen closet that was no longer in use. We found two old t-shirts (one black and one yellow) that were too small for anyone to wear. We used an old cereal box to cut up and make a stiff Triforce template design for use on the t-shirt fabric. And lastly, we used our simple (and cheap) sewing kit. 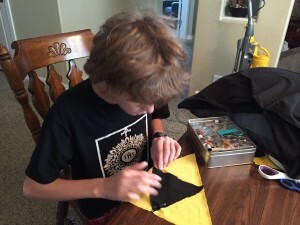 So now it was time to get Tommy started on sewing. After getting the Triforce design cut out of the old yellow and black t-shirts, he sewed them together. Then he had a LOT of stitching to do. Might as well get comfy! Since the black t-shirt was solid, we figured we’d take a short cut and turn it into a pillow case. We only had to cut off the sleeves and stitch along the top and bottom. Yep, the pillow works just fine.. There you have it, a homemade Triforce pillow made for free. The only cost was time and my patience.